Randall Amplifiers announces the new RT Series of all tube guitar amplifiers. The series is pro caliber and at a price point that would normally be considered solid state territory. It offers novices and solid state fans the opportunity to step into the world of real tube tone. The series includes three heads, the RT103, RT503 & RT50, one combo, the RT50C and two cabinets, The RT412XC & RT212XC. The RT103 is a 3 channel, 100 Watt head with reverb and the RT503 is a 50 watt version. Both heads feature one clean channel and two overdrive channels. The RT50 is a 2 channel, 50 watt head with reverb featuring one clean and one overdrive channel. The RT412XC and RT212XC are cabinets that are perfectly matched to the RT Series heads with the same cosmetics including black chrome grills and black tolex covering. Both cabinets feature Celestion speakers. 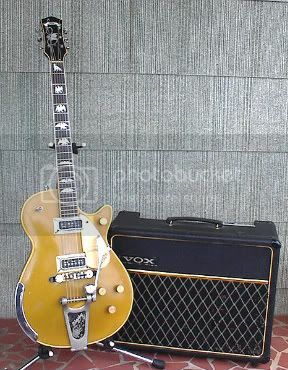 The RT50C is a 50 watt, 2 channel, 1×12 combo amp featuring the same electronics as the RT50 head and a 12″ Celestion speaker all in one portable package. What really sets these Randall amps apart from other tube amps is the power tube bias test points. No longer do guitarists have to purchase matched sets of tubes. The user-friendly power tube bias section on the back allows the user to replace, bias & match the tubes themselves with just an inexpensive volt meter. We’re going to keep a check on these bad boy’s prices.